Thank you to all who attended the Jefferson Park Skatepark and Community Update meeting! Your participation in designing this skatepark is essential and we look forward to receiving further input. How do you like to skate? What do you want to see in this park? Grindline needs your input by the end of the month. They will use this input to create refined conceptual designs that will be presented at the next meeting on May 26, 2010. Comments will be taken until April 28, 2010. Please let your friends know about the Grindline site and this opportunity to help design an exciting new skatepark at Jefferson Park. Click on this image to see a larger version of the Jefferson Park Food Forest plan. Pictured here is the first of several design options for the proposed Jefferson Park Food Forest. First and foremost, this would be a community garden where neighbors could interact and grow their own food. It would be a garden run and managed by community members and citywide supporters, to achieve a bit more food security by having a local food production facility. Second, it’s about creating a healthy park environment for all to enjoy. Third, it’s about promoting gardening as a sustainable recreation. Please remember this is a “design in process” as we look forward to more input from the community. 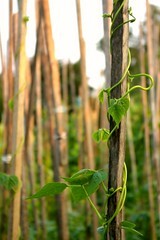 A food forest is a gardening technique or land management system modeled after a woodland ecosystem, but which substitutes trees, shrubs, herbs, and vegetables which have a higher yield for humans. It’s a polyculture method (as opposed to monoculture) of planting in guilds (combinations) that nurture each other through nutrient—soil fixing, attracting pollinators and self-mulching. The result is an edible woodland with meadows, pathways, and a grand source of fresh air. The Jefferson Park Food Forest is located on the southern part of the western slope of Jefferson Park and covers about four acres. In the map pictured here, 15th Avenue South is shown on the left (west), South Dakota Street is near the bottom (south) and the reservoir playfield is up on the right (east). Seasonal water collection is shown in blue. The blue areas would be wet in the rainy season and dry in the summer. Paved areas are shown in orange with 16th Avenue South serving as a water collecting swale. Trees are shown in green with most of the forest on the hill to the east. The green areas are swaths of mixed plantings mostly consisting of berries and natives. Green colored P-Patches have curved paths (orange) through them. The yellow circle is a community shade structure with tool shed sub-grade. The City-adopted North Beacon Hill Neighborhood Plan (2000) for this property calls for a forested, naturalized terrace with pedestrian pathways, educational facilities, and view accesses (Action PE2). This project builds on that adopted concept to create a food forest that is natural and educational, but more focused in producing food with recreational gardening. It also builds on the adopted recommendation in our neighborhood plan for distinctive park entry improvements in this area (Action PE4). The Jefferson Park Alliance did outreach to the larger community at the last Beacon Hill Festival (2009) on this concept and received significant positive interest from people who would like to garden and support urban agriculture in the park. We will be presenting this design and answering questions on April 1 at the North Beacon Hill Council meeting and at the 2010 Beacon Hill Festival on June 5. We have a Food Forest meeting scheduled for April 6, 7:00 pm at the Lawn Bowling Clubhouse (4103 Beacon Avenue South) if you would like to hear more. Thank You. Glenn Herlihy is part of a group that is guiding the Food Forest proposal through the application process for the city’s Parks and Green Spaces Levy Opportunity Fund. 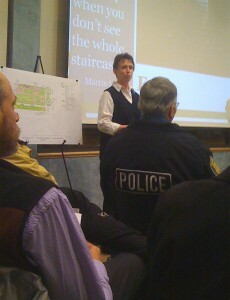 Bev Graff of Findlay Street Church opens a presentation on the new church building to be built at 14th and Bayview. Photo by Wendi. Al Terry and Barb Graff from Findlay Street Church presented the plans for their new sanctuary with affordable housing to be built at 14th and Bayview. You can see the slides on the church’s website. Some concern was expressed about parking impacts, but by and large the proposed development appeared to be welcomed. Cheryl Sizov from the Seattle Department of Planning and Development presented an introduction to the DPD’s process of revising the Seattle Citywide Design Guidelines, originally created in 1993, used in the design review process, and used as the baseline for the various neighborhood design guidelines since. Largely, it’s a simplification and clarification measure, reducing the five original categories to three and the 31 original guidelines to 13, but bringing extra attention to the “sub-issues”, increasing them from 19 to 50. See the proposed revisions on the DPD website. Public comment is accepted until March 31st. A motion was made to provide a vote of support to Glenn Herlihy’s 12-acre multi-focal gardening project on the western edge of Jefferson Park along 15th Ave S (some details in the forum), for use in applying for $250,000 in grants to advance the project. There was hesitance expressed by several attendees about issuing formal support for a project most of the council wasn’t terribly familiar with, and the motion was tabled until the April 1st NBHC meeting. Hopefully, there will be more details about the plan available here or in the forum by then. David Gackenbach and Andrew Abian presented some initial thoughts about submitting for Parks funds for a project that would add to the open green space on Beacon Hill by using grant money to negotiate the purchase of the entire block at 17th and Walker, currently occupied by a single home, and converting it to a park. Expect more details about this project to appear here on the blog soon. This was another well-attended meeting, with likely more than fifty neighbors turning out. Next month, expect an appearance by City Council member Sally Bagshaw, speaking about parks and open space. Hopefully we’ll see you there! Good news… is all we got now. The Parks Department has sent us a letter to go ahead and apply for the second round of applications for the Levy Opportunity Fund. The application is due April 2nd and we’re going to do it. This has potential to build a lot of our Garden and is a great exercise for all who want understand public fund raising. The VA Hospital has contacted us and is interested in some P-Patch or garden space for garden therapy. We can help with that. We now have interested people from the community, Parks Department, Asa Mercer school, VA hospital, Mara Farms, Permaculture groups in the Seattle area and few others I may have missed. On top of that I just learned one of my good friends is good friends with Mr. MacPherson of MacPherson’s Produce. Maybe they would like some local fruit in a few years. what to do with the 16th Ave dirt road and other design elements. Please spread the word. All are welcome to attend. If you have anything interesting flowering in your garden and want to share it with us please bring it. The meeting is scheduled for Tuesday, March 2nd at 7pm at the Lawn Bowling Club House (4103 Beacon Avenue South). It’s springtime, and the garden is happening again. For those of you who know of, or have visited “The Garden,” and you know where I mean, this “e.” is for you. Please don’t pick the flowers or dig up plants. If you take them, no-one else can then enjoy them. If you have a dog to walk, fine — but please keep your pet on the road, not in the garden, and pick up your messes. Someone has been throwing their doggy doo doo bags into the woods. There is a trash can down at the overview park at 12th and McClellan. Thanks, and cheers to a great early spring. Alleycat Acres broke ground this past weekend on Beacon Hill. They’ve got photos on Flickr. Read more on Urban Food Producer and in the forums here. A work party is planned for Sunday. More information is after the jump. 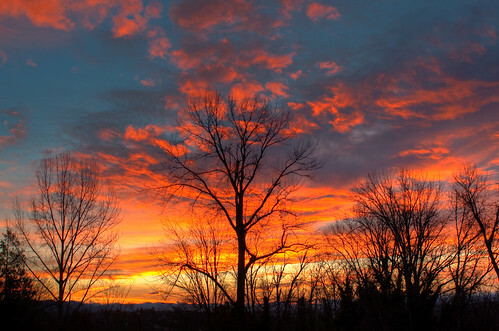 Apparently yesterday’s sunrise was amazing, though we missed it. Luckily for the blog, Joel Lee and Freeman Mester were paying attention to the sky and posted these amazing photos to the Beacon Hill Blog photo pool on Flickr. Notice that the cloud formations are very similar; the photos must have been taken at nearly the same moment. Photo in Jefferson Park, by Joel Lee, and taken with a cell phone camera! 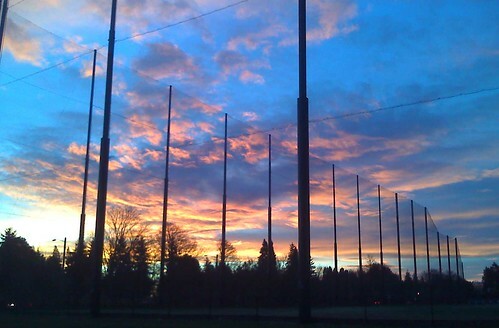 Golfers practicing drives under the bright lights of the Jefferson Park Driving Range. Photo by Tim Ripley. They don't all reach their target. Photo by Tim Ripley. These are two of the many interesting and wonderful photos you can find in the Beacon Hill Blog photo pool on Flickr. Thanks to Tim for posting them!